You're the right page if you want to know when JAMB exams slip printing will start. You will be guided on how to check JAMB exam date and venue or know the portal to print exams slip/schedule. 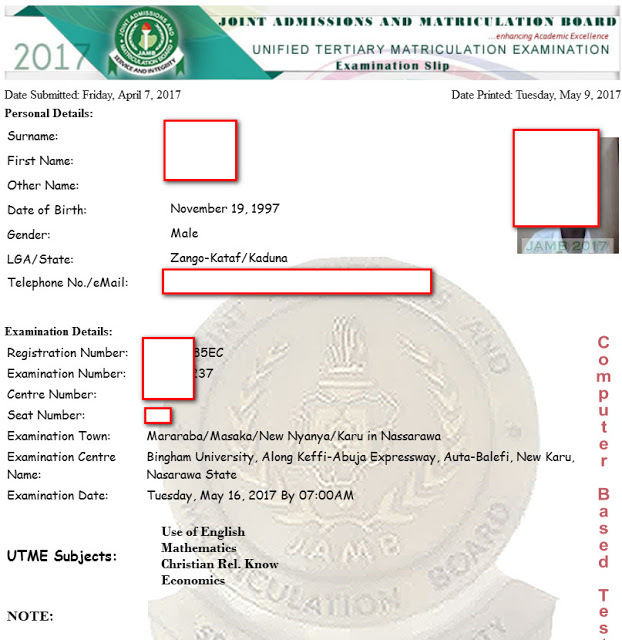 Some UTME candidates had contacted me to ask when JAMB will start to allow them to reprint their exams schedule slips. Some were confused after being registered but no centre/venue of exams on their print-outs. Some were left perplexed when nothing was written on it regards the time of the exams, dates of the exams and seat numbers. Well, this post is meant to shed light on this. Read on. Don’t be confused if you find yourself in those cases above. It’s a general thing. Every candidate completes UTME without venue, exams date, time or seat number on his or her slip. JAMB will later schedule you for exams after registration is closed. So wait till the registration finally closes before being on the lookout for your exams venue, date, time and seat number. The only thing that a CBT centre give you for now, is the registration slip containing only your bio-data, UTME subjects and schools/courses of choice. The registration centre will also give you the literature book to be read for your Use of English. When the time comes to reprint exams slips, JAMB will announce. You should subscribe to this blog to receive email message on when the reprinting starts. Reprinting of JAMB slip or exams schedule slip will start on April 2 (now postponed till April 4). Writing of the exams runs from April 11 till 16. Having said that, candidates are not required to go back to CBT centre in order to print their JAMB exams schedule slip. Safe yourself the headache! You can also log into the email you used to register your UTME. A message containing your attached exam slip will be there. Download and print the slip.